While Washington waxes poetic about the need to more forcefully confront ISIS and destroy its military and terrorist infrastructure, the actual policies it has pursued are designed to achieve just the opposite. 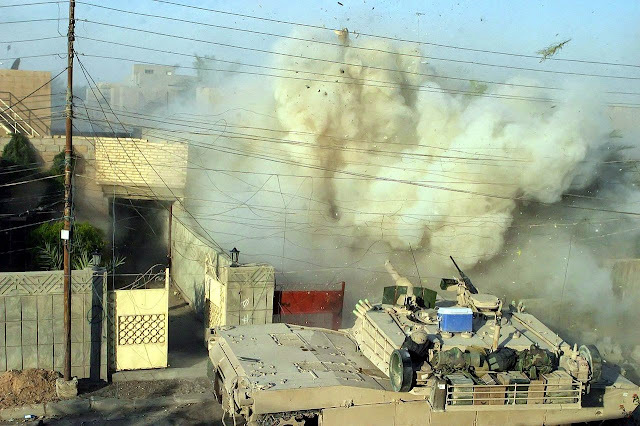 May 23, 2015 (Eric Draitser - NEO) - The Western media has been consumed in recent days with the news that Islamic State militants have captured the strategically critical city of Ramadi in Iraq. The narrative is one of incompetence on the part of Iraqi military forces who, the corporate media tells us, are simply either ineffectual or hopelessly corrupt. Some analysts and pundits, especially those on the right who oppose Obama for various reasons, have used the fall of Ramadi to legitimize their claims that Obama’s “weakness” on the ISIS issue brought events to this point. While there is truth to the assertion that Iraqi military forces are riddled with severe problems, from sectarianism in the command hierarchy, to poor training and, at times, organizational disarray, none of these issues is singularly responsible for the loss of Ramadi. Nor is it entirely accurate to say that Obama’s alleged weakness is really the cause. Rather the primary reason, the one which the media carefully avoids including in their reportage, is the political and military sabotage of Iraq perpetrated by the United States in pursuit of its long-term agenda. Indeed, while Washington waxes poetic about the need to more forcefully confront ISIS and destroy its military and terrorist infrastructure, the actual policies it has pursued are designed to achieve just the opposite. Instead of promoting unity of command and execution within the Iraqi armed forces, the Pentagon, Congress, and the White House have done everything to fracture Iraq’s political and military structures, fomenting rather than mollifying sectarian conflicts. Then the Washington Post can publish editorials blasting Iraqi fecklessness, and calling for a more robust US military presence. In this way, the US policy of promoting division and weakness within Iraq has directly led to the dire situation in Ramadi and throughout the country. 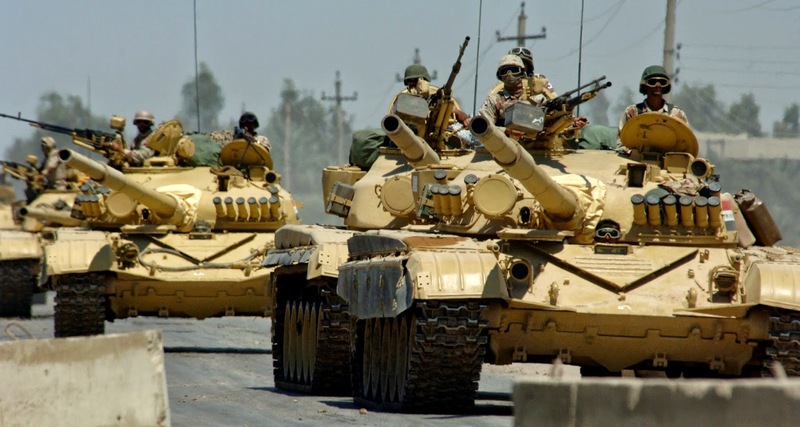 How Washington is Destroying Iraq…Again! The fall of Ramadi has provided ammunition to opponents of Obama whose central argument – if such insanity can be believed – remains that the US should wage further war in Iraq. Leading warmongers, Republican Senators John McCain and Lindsey Graham, both claim that the failure is due to Obama’s “big mistake” in not leaving behind troops in 2011. Graham described US policy as “a failure of Obama’s military strategy,” while McCain referred to it as “one of the most disgraceful episodes in American history… [The] policy…is not enough of anything,” Aside from the obvious absurdity of their claims, McCain and Graham, and the media narrative surrounding the entire issue, are a perfect illustration of the utterly backwards narrative presented by the corporate media to the American public. In reality, the US, with Congress very much playing a central role, has studiously worked to undermine any chances for national resistance and military victory inside Iraq by Iraqi security forces. Perhaps Graham and McCain forgot that the US has worked diligently to create divisions between Sunni, Shia, and Kurdish elements within the Iraqi military architecture. As recently as late April 2015, Congressional Republicans were pushing for a defense authorization bill that would directly arm and fund Sunni and Kurdish militias inside Iraq, treating them as “independent countries.” An obvious means of fomenting further sectarian conflicts and fracturing the fragile and precarious unity of the government in Baghdad and its military forces, this bill is indicative of a broader policy, one aimed at de facto partition of Iraq along ethno-religious lines. Moreover, those who follow US politics and military adventurism should understand that legislation follows rather than precedes the policy. The US has likely been arming Sunni and Kurdish factions for a long time already, thereby further degrading the continuity of the military. But aside from the political attempts to fragment the country, US military actions belie the real agenda which, rather than combating ISIS, is geared towards degradation of military capability of all sides, which is, in effect, support for ISIS. Looking at a map, one begins to see then that ISIS has received US support in each of the strategically significant areas where it has made important gains. When reports of US airdrops going to ISIS in the province of Salahuddin first emerged, it coincided with the group’s military success in Tikrit. Now we see Ramadi in the easternmost part of Anbar province has fallen within weeks of more reports emerging of US-supplied arms being destined for ISIS in the al-Baqdadi region of Anbar. Taken in total then, it seems that US strategy has been to overtly attack ISIS while covertly supporting it. Similarly, the US has claimed to be supporting, or at least collaborating indirectly, with Shiite militias connected to Iran. At the very same time, those militias have repeatedly claimed that US has bombed them deliberately. Such seemingly contradictory military objectives lead to the inescapable conclusion that US policy has been, and continues to be, chaos and fomenting war. So for Washington to now claim that the fall of Ramadi is somehow a major tragedy, that it represents a failure of strategy, is utter disinformation. 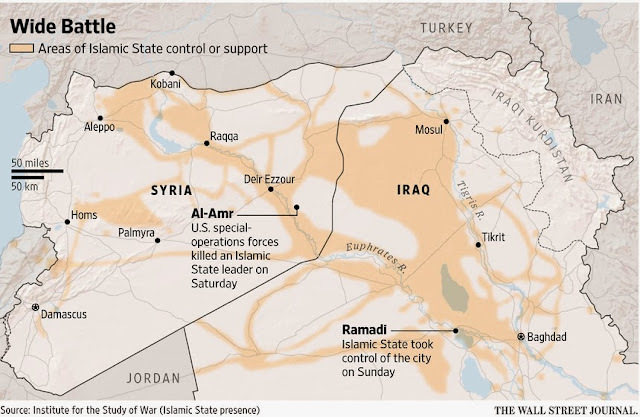 In effect, the fall of Ramadi is an orchestrated outgrowth of the “managed chaos” strategy. From a purely geopolitical perspective, the aim of the US is to foment sectarian conflict and prolong the war in Iraq as a means of checking Iranian influence in Iraq and throughout the region. The US is mostly incapable of achieving such an objective in Syria due to the continued success and cohesion of the Syrian Arab Army; in Iraq this is very much achievable. But this fragmentation and de facto partition of the country has been a long-standing policy, one that the US has pursued in myriad ways for more than a decade. Keen political observers will recall that even before, and during the early stages, of the Iraq War in 2003, there was serious talk of dividing Iraq into religiously and ethnically homogenous territories. As influential neocon and President Emeritus of the Council on Foreign Relations Leslie Gelb wrote in an op-ed in the NY Times in November 2003, “The only viable strategy…may be to correct the historical defect and move in stages toward a three-state solution: Kurds in the north, Sunnis in the center and Shiites in the south.” While this policy was not enacted immediately, the United States has always pursued this long-term strategy to varying degrees. The major stumbling block has been the stubborn desire of various members of Iraq’s political elite to be independent and sovereign actors, not US puppets. The primary offender from Washington’s perspective was former Prime Minister, and current Vice President, Nouri al-Maliki, who refused to bow to the diktats of Washington, and was instead portrayed as a corrupt, autocratic Iranian stooge. But what were Maliki’s real transgressions from Washington’s perspective? At the urging of American officials who sought to sideline the [Shiite] militias, Mr. Abadi… gambled that the combination of United States airstrikes and local Sunni tribal fighters would be able to drive Islamic State fighters out of [Ramadi]…But as the setback brought the Shiite militias, and their Iranian backers, back into the picture in Anbar, intensified Shiite infighting appeared to leave the prime minister more vulnerable than ever… He became prime minister last year with strong backing from the United States on the belief that he would be a more inclusive leader than his predecessor, Nuri Kamal al-Maliki, and would reach out to the country’s minority Sunni Arabs and Kurds. Mr. Abadi has done so, by pushing for the arming of local Sunni tribesmen and reaching a deal with the Kurds to share oil revenue. As the Times correctly notes, Abadi has, quite predictably, followed orders from Washington and pursued a strategy which, from the western perspective is “inclusive,” but is in reality very much sectarian. This is the inverted reality that the US and the Western media portrays; the arming and support for Sunni and Kurdish factions is “inclusive” rather than divisive, which is what it is in the real world. By forcing the Shiites, the dominant group demographically and politically in Iraq, into a secondary role, the US once again foments, rather than bridges sectarian divides. What is this called if not “divide and conquer”? It should not be lost on anyone that this policy which, as noted above, dates back more than a decade, is all designed to curb Iranian influence in Iraq and throughout the Middle East. By forcing Shiites into the back seat politically, economically, and militarily, the US has hoped to stifle Iran’s development from isolated nation into a regional power. By doing so, the US once again acts in its own interests, as well as those, of course, of Israel, Saudi Arabia, Qatar, and Turkey. Perhaps that grouping of countries rings a bell for people following the development of the war on Syria these past four years? Indeed, it is the same actors. Seen in this way then, the US agenda and strategy in Iraq is precisely the same as that for the entire region: block Iran (and, on a grander scale, Russia and China) with regime change when and where possible. When regime change is impossible or undesirable, inflict chaos and foment conflict. One might call such a policy cynicism of the highest order. While true, there are still other words that perhaps better reflect the true insidiousness of it all: colonialism and imperialism.